Last week, Visual Studio “15” Preview 5 was made available for download. This release has a number of exciting changes and improvements for Python developers that we are going to be covering over the next few weeks. Today’s post will look at the new install experience, covering the improvements and the new options to be aware of. When you first run the Visual Studio “15” Preview 5 installer, rather than the traditional setup, you’ll see a collection of workloads. Rather than giving you a default install with most features, we’ve broken the product up into a much more fine-grained set of components, each of which can be individually enabled or disabled. A workload is a preconfigured set of components, designed to make it easy for you to know what to select. The two workloads our team is responsible for are Python development and Data science and analytical applications. These are designed to quickly get you started in Python for desktop, server and cloud, or to give you a data-science focused IDE that includes Python, R and F#. You can select either or both workloads, as well as any of the others, to get our recommended set of tools. For the Python development workload, you will get support for Python editing, debugging (including remote and mixed-mode debugging), profiling, unittest tests, cookiecutter templates, as well as a copy of CPython 3.5. Some of the options available to you on the right-hand side include older or 32-bit versions of CPython, easy installation of Anaconda from Continuum Analytics, native Python development tools and support for Windows IoT Core. The Data Science workload is designed to install the key tools and runtimes you may need for analysis, visualization, machine learning and scientific computing work. You can choose from F#, Python and R support – all languages supporting interactive, data-focused development – and we include the Microsoft R Client and Anaconda. If you are already using another version of R or Python, you can deselect these and continue to use your own. We still have time and work to do before Visual Studio “15” is ready for prime-time, but we hope you appreciate getting a chance to try out early functionality. Beyond installation, we also have a range of improvements to Python support, including cookiecutter templates, interactive window management, out-of-process code analysis, editor code cells, project-less browsing, and a huge amount of bug fixes. Over the next few weeks we will post more detailed blogs about some of these enhancements. We hope you will enjoy using Python and R in this preview of Visual Studio “15”. 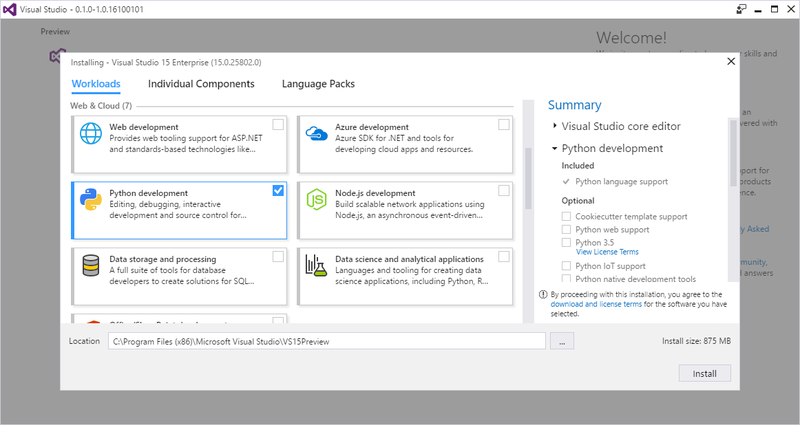 Feel free to send feedback through the tools within Visual Studio, or post directly to our github site, which is also where you can obtain all the sources for Python support and see our full release notes.